Adventures of an Art Teacher: How can I not do this lesson again? How can I not do this lesson again? Not a very good quality photo but you get the idea! Every once in a while I like to read through the comments left on artwork in my school's Artsonia gallery. 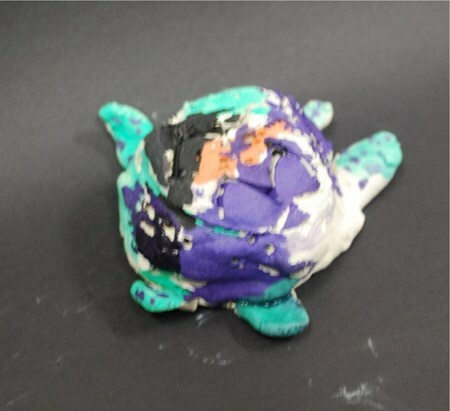 I just noticed a comment that a little brother left on his sister's clay turtle from last year. My gosh that is the sweetest thing ever. I just had a little kid remind me of a dragon he made and the wings broke I lovingly glued on the red foam for the wings. When it went unclaimed for over a year, I forgot who made it, I threw it out. He developed cancer. Now he's back and guess what he's asking for. . . gulp! I have got to do a clay project with them pronto and tell him a good story about a boy who loved that dragon so and had such a hard life so I told him he could have it and it made him so happy, okay maybe I'll just tell him it might have flown away.